Alignsat auto-pointing flyaway antenna is a high performance, high environment adaptivity satellite antenna dedicated to emergency wideband communications. The antenna has a light weight and it is available for multiple transportations. 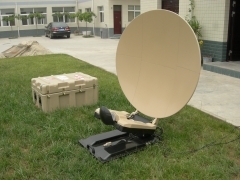 Alignsat auto-pointing flyaway antenna is a high performance, high environment adaptively satellite antenna dedicated to emergency wideband communications. The antenna has a light weight and it is available for multiple transportations. The antenna adopts modular design, with reliable structural strength, easy operations, simple access without professional tools, it can better finish high-difficulty tasks in various environment. The antenna can be used for all domestic & international Ku&Ka band communication satellites. Emergency communication of counter-terrorism, nature disasters; TV live broadcasting, measurement & monitoring, government emergency communication department, civil defense, news media, mobile communication operator, public security, fire control, border defense, military, enterprises and institutions, etc. Better RF feature, high gain, low sidelobe, remarkable cross-pol. "One button acquisition" realizes non-professional personnel can easily follow the instruction to finish satellite acquisition. Reflector uses carbon fiber material, (dominate 60% of the antenna set), it has the features of high strength and light weight. The auto acquisition device includes a dual axis positioner, a GPS receiver and a digital compass.